With Eastern football disrespected in many quarters and the belief that big brothers Penn State, Syracuse, and Pitt often filled their schedules with too many Bucknells, Colgates, and Ivy opponents, many of their excellent teams in the late 1940’s through the early 1970’s sometimes took a backseat to Southern or Midwestern programs that truly weren't as talented. However if disrespect is the main topic, few major university football programs suffered from regional prejudice to the extent that Arizona State did. Four school names, four conference affiliations, games played in what was the middle of the night in many parts of the country, and an absence of media coverage and bowl invitations while going undefeated was the fate of what began as The Territorial Normal School at Tempe. There were a few outstanding players that managed to receive their deserved recognition with Norris Steverson an All Southwest halfback in 1931 the first ASU player to receive the honor. He was also the first Sun Devil to be taken in the professional football league draft and became the long-time gymnastics team coach for Arizona State. 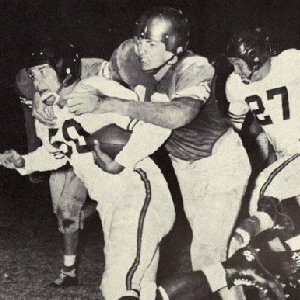 On the fine 1939 and ’40 squads that won the Border Conference Championships in both seasons, backfield mates halfback Hascall Henshaw and fullback Wayne “Ripper” Pitts were All Conference performers with Pitts the first ASU player to achieve truly national recognition when he was named as a member of the Little All American team. Struggling in an under-populated area, the entire athletic program was abandoned from 1943 through 1945 due to the manpower shortage of World War II. When they restarted the program in 1946, their 2-7-2 record wasn’t unexpected. The highlight of the entire 1946 fall may have been the official recognition of having the athletic team mascots named the Sun Devils. Previous representation as Owls and Bulldogs had not struck a responsive chord among the student body or fans and this new nickname seemed to fit perfectly and on November 20th, the official vote made it obvious that the Student Council agreed. Through its history, it seemed as if everyone connected with Arizona State believed that the University Of Arizona had attempted to thwart its attempts to grow, prosper, and enhance its physical facility, faculty, and athletic success. The ’46 season’s 67-0 thrashing by their hated rival, the university that made it a point to out-do and hamstring what was now The Arizona State Teachers College stimulated changes. The Sun Angels Foundation booster club was formed and a new logo of an aggressive Sun Devil named Sparky was developed by Walt Disney artist Bert Anthony. This logo became the symbolic notation that a new day had arrived in Tempe. Now seeking a coach who could beat Arizona, Ed Doherty, a former QB under Frank Leahy at Boston College who later joined him as an assistant on the Notre Dame staff stayed long enough to compile a respectable 25-17 record from 1947-50 with two Phoenix-based Salad Bowl bids and a 2-2 split with Arizona. His first “big gun” was a holdover from the 1946 squad, Jim Montgomery who captained the team, led the nation in receiving, and was one of the NCAA’s top punters in 1946. He was All Border Conference in both 1946 and ‘47. Feuding with the AD and boosters, Doherty left to ironically return in later years to coach at rival Arizona, however he had the pleasure of coaching a player who put Arizona State a bit higher on the ladder of regional if not national recognition. Mesa, Arizona High School running back Wilford White whose exploits would lend him the nickname “Whizzer” was a high school senior who had no intention of playing at Arizona State until witnessing the 1946 67-0 whitewash put on the Tempe squad by Arizona. Feeling as if the Wildcats had bullied and taken advantage of a much weaker ASU team, a squad that had perhaps one outstanding player in huge 6’3”, 265 pound Glenn Johnson who later played tackle for the AAFC Yankees and the NFL Packers, he was attracted to the underdog school and accepted their scholarship offer in 1947. In his varsity tenure, the team improved annually until his senior season in 1950 where White’s 1502 rushing yards and twenty-two touchdowns earned him All Border Conference honors, making him a three-year selection, and led the Sun Devils to a 9-2 finish. The seven TD’s White scored against Idaho in his final regular season game put the exclamation mark on a great career. He followed with two seasons in the uniform of the Chicago Bears and later made an additional contribution as his son Wilford “Danny” White became the standard by which all other ASU quarterbacks were judged. Larry Siemering was hired for the '51 season, a former Washington Redskin who had been the head man at College Of Pacific. He introduced the squad to the Riddell RT plastic suspension helmet, an all black shell that was worn through the 1954 season. Siemering had to rebuild a team decimated by graduation, and had little more than All Conference picks tackle Dom Patrone and HB Marvin Wahlin to lean on. He did however, have a late entry and an excellent player in Andy Matesic who helped lead the team into the program’s first truly big-time game against a nationally known opponent. The Sun Devils were besting Arkansas at the half but did not have the depth to sustain the effort and lost 30-13 but the Devils were now on the national landscape. They bombed Arizona 61-14 and set an NCAA record with four backs tallying one-hundred plus yards. Unfortunately, Andy Matesic was actually Joe Matesic who had played at Indiana University the year before and he and others had powered the squad while being ineligible. The fall-out included the resignation of Siemering, two years of NCAA probation, and the scorn of their enemy, Arizona. Matesic landed on his feet, later playing briefly with the Steelers. For the 1952 season, Clyde Smith was hired from Indiana, a bit of coincidence as he had coached the offending Matesic there. He had a task in front of him with Wyoming canceling their game due to "the situation at Arizona State College" and others looking down on the program as cheaters. With games played after sundown in an attempt to avoid the scorching heat of mid-day, the all black Sun Devil headgear that Smith maintained from the season before proved to be intimidating to opponents in the desert night. When St. Mary’s College of California dropped their program after the 1951 season, former ASC coach Siemering’s lasting contribution to the team occurred before he resigned when he lured a player who would be a mainstay of Smith’s first Sun Devils squad. John Henry Johnson represented the university for only that '52 season but he was a man playing with boys. He scored three TD's in the first game and then was inexplicably used only on defense for the remainder of the season. Johnson’s last minute end zone interception saved the Arizona game allowing ASC to win the Border Conference title with a 6-3 record. Johnson played in the CFL for one season and then went on to a twelve-year Pro Football Hall Of Fame career, a fearsome fullback known for his ability to dole out more physical punishment than he received for the Forty Niners, Lions, and Steelers. He completed his career with a final season in Houston. Tackle John Jankans of Pennsylvania was outstanding and made first-team All Conference as a freshman, with Johnson, end John Allen, and ’51 honoree HB Marvin Wahlin also winning All Border Conference accolades. Guard Earl Putnam, one of a number of players at ASU from Cincinnati’s Hughes High School, was stout at guard and served briefly with the Bears. Using a Split-T Formation, Allen and QB Dave Graybill formed the engine in 1953's 4-5-1 squad with Jankans moved from tackle to guard, and again an All Conference performer. While arguments rage about who was the greatest professional running back in the history of professional football, there has rarely been an argument about who was the toughest. If the discussion pertained to “who could take the most punishment and who could dish it out?” better than anyone else in the modern game, it was John Henry Johnson and he was feared because of that one characteristic. At Pittsburg High School in the East Bay area of Oakland, California Johnson earned the reputation as one of the area’s greatest athletes and earned All Contra Costa County honors in football, basketball, and track. He began his collegiate career at St. Mary’s College but after they dropped football, he transferred to Arizona State and played only the 1952 season. He could do it all and taking the field almost exclusively as a defensive player, was underutilized and perhaps misused. Although drafted by the Steelers in the second round of the NFL draft, Johnson continued his football career with Calgary of the CFL and was an immediate hit, winning the Nicklin Memorial Trophy as the Western Division’s MVP. He returned to the NFL with the Forty Niners in ‘54 as part of “The Million Dollar Backfield” of eventual fellow Pro Football Hall Of Fame members Joe “The Jet” Perry, Y.A. Tittle, and Hugh “The King” McElhenny, still recognized as one of the best groupings of all time. He played with the Detroit Lions, helping Bobby Layne lead them to glory from 1957 through ’59. Johnson joined former Lion backfield teammates Layne and Tom Tracey on the Steelers in 1960 and played with them through 1965. Although the Steelers teams of Johnson’s years weren’t always good, they were always physically brutal and Johnson led their parade, a combination of power and speed who was not to be messed with via legal or late-hits because he would retaliate in kind. (see HELMET HUT feature at http://www.helmethut.com/jhjon.html ). He was the first Pittsburgh player to gain over 200 yards in a single game and by the time he retired, spending his final year with the AFL Oilers in 1966, his 6803 yards placed him fourth on the all time list of NFL rushers. Adding 1478 receiving yards and leaving the game as one of its most respected blocking backs of all time guaranteed his delivery to The Pro Football Hall Of Fame. In 1954, it wasn't the 5-5 finish as much as the second straight bad loss to Arizona, this one a 54-0 disaster, that sealed Smith's fate. The good news for the year was the play of tackle Jankans, a three-time All Conference pick and the arrival of freshman HB Bobby Mulgado. End Gene Mitcham was reliable and had a fling with the Eagles. More good news came as Arizona State College achieved university status although the continuing efforts of in-state rival Arizona prevented an immediate name change that reflected the enhanced status for the Sun Devils. Coach Smith took the easiest way out and stepped up to the Athletic Director's chair while Michigan State backfield assistant Dan Devine became the head coach.